Many of UC Santa Cruz's roads were named in honor of people whose support was vital to the founding of the campus. 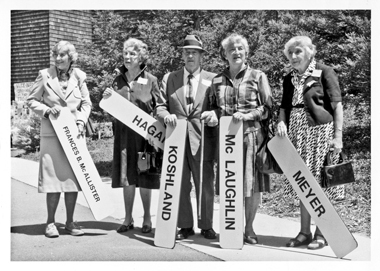 Pictured are (left to right): Frances McAllister, a generous donor; Ella Barrows Hagar, widow of Regent Gerald Hagar; Regent Daniel Koshland; Sylvia McLaughlin, widow of Regent Donald McLaughlin; and Virginia Meyer, widow of Regent Theodore Meyer. Celebration of Porter College an dthe Porter Endowment in May 2013. (The Cliff family members are descendants of Benjamin F. Porter.) Front row: Sheila Houser Cliff, Nell Sesnon Cliff, Diane Porter Cooley, and Molly Cliff Hilts (Molly Porter Cliff, Porter '81); Back row: Peter Cliff, Lee H. Cliff, Daniel Cliff, Shanti Cliff Aurell (Susan Harker Cliff, Merrill '86), and Paul Aurell. The names of UC Santa Cruz's unique colleges, buildings, and centers may seem natural and inevitable, as much a part of the campus's landscape as its famous towering redwood trees and rambling meadows. But each name evokes a surprising story about visionaries, benefactors, legacies, and leaders who shaped the vision of the campus—sometimes in obvious and direct ways, and sometimes by sheer inspiration. After driving over the Santa Cruz Mountains on a blistering summer day, the UC Regents, scouting out possible locations for a new Central Coast campus, felt the cool ocean breezes on their faces. Up at the Cowell Ranch property, high in the foothills overlooking downtown Santa Cruz, it was just the right combination of sunshine and temperature. As legend has it, Almaden Valley in San Jose, another potential location for the campus, was so hot and muggy that the Regents groaned in discomfort and would speak no more about locating the campus there. Soon the UC Santa Cruz campus began to take root at Cowell Ranch, adding a brand-new chapter for a piece of land that was already rich with history. The Cowell family had relocated from San Francisco in the late part of the 19th century, after amassing a sizable fortune during the Gold Rush. Henry Cowell bought into a lime rock company near Santa Cruz and moved his family down to the Central Coast. Cowell had six children—Roland (who lived only one year), Ernest, Isabella, Sarah, Samuel Henry (known as S.H. or Harry), and Helen. Cowell Ranch became a self-contained community with orchards, a dairy, lumber yard, hay building, and stables. The Cowells prospered there—and also faced tragedy. In 1903 Cowell's daughter Sarah was thrown from a horse and died, giving rise to a legend that her ghost still haunts a meadow on campus. The heartbroken Henry Cowell died just a few months after his daughter. Ernest Cowell died in 1911, and then his sisters passed away. But S.H. lived long enough to impart a strong environmental legacy that helped bring about the creation of a fledgling campus; instead of selling off the old ranch property, he took pains to preserve it. A staunch environmentalist, he deeded Cowell Beach to the City of Santa Cruz, as well as the area that became Henry Cowell Redwoods State Park. In 1955, S.H., the last Cowell, died and provided in his will for the creation of the S.H. Cowell Foundation. In 1961, the UC Regents purchased the ranch for $2 million, with the Cowell Foundation donating back $900,000 of the final price. "Harry Cowell would be delighted to see all those smart, environmentally conscious young people at the university," said Ann Alpers, president of the Cowell Foundation. "I can't stress enough how grateful the foundation is to have the university be a good steward for the magnificent land that was the Cowells' home." The Porter family's roots in the Santa Cruz area go back even further than the Cowells'; in fact, their history in the region spans more than 160 years. Benjamin Porter moved to California from the East Coast in 1851 and, with his cousin George Porter, acquired the Soquel Tannery on what is now Porter Gulch. 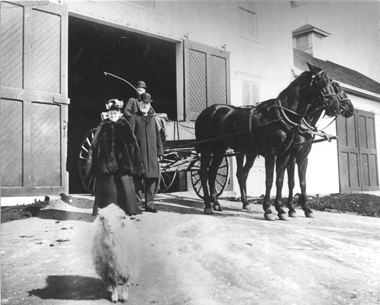 After marrying Kate Hubbard, he went on to become one of the early directors of Santa Cruz County National Bank. The couple's only surviving child, Mary Sophia, an artist, married William T. Sesnon, a politician from Alameda. In 1911, to honor Mary's parents, the Sesnons built the Porter-Sesnon House (then known as Pino Alto), a summer home on the original Porter property, currently home to Cabrillo College. Pino Alto became a place for artists and free thinkers to gather, along with patrons and dignitaries of the day. These summer soirées would often go on for days. Molly Cliff Hilts is Mary's great-granddaughter—and a UC Santa Cruz alumna (she was Molly Porter Cliff in her student days). "I feel a strong artistic kinship with my great-grandmother," said Cliff Hilts (Porter '81, art), mentioning their shared focus on community and celebrating artists. As a student, Cliff Hilts, a Portland artist, had her first exhibition at the Sesnon Gallery in 1981, when the college was named for her great-great-grandfather. "Coincidentally, my senior show was exhibiting at the Sesnon Gallery during the Porter dedication, and I remember my grandfather walking through the gallery that day," she said. "It was the first time he had seen my body of work from college." The Mary Porter Sesnon Art Gallery was established in 1968 with a gift from Mary's daughter, Barbara Sesnon Cartan, in memory of her mother. Cliff Hilts is now developing an exhibition that honors her great-grandmother through a contemporary lens that could tie into the gallery's 50th anniversary in 2018. The Porter and Sesnon families have a longstanding legacy that continues to this day on campus. If you were to look through their family tree you would find UC Santa Cruz alumni and recent donors to the campus, as well as a former UC Santa Cruz Foundation trustee and president. 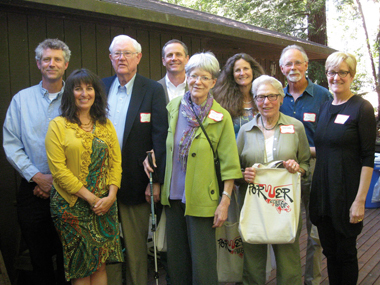 Members of the Baskin family have been important supporters of UC Santa Cruz since 1971. The Baskin School of Engineering and Baskin Engineering Building are named in honor of engineer, retired developer, and philanthropist Jack Baskin, whose gifts to the Baskin School of Engineering since 1971 total more than $10 million. While engineering has always been Baskin's passion, he and his family have given widely and generously across the disciplines. The family has also contributed to the Elena Baskin Visual Arts Center, the Institute of Marine Sciences, Shakespeare Santa Cruz, feminist studies, an endowed chair in psychology, a scholarship in literature, and instruction in the arts. Since 2007, the Peggy and Jack Baskin Foundation has contributed $765,000 for girls in engineering and science programs, and scholarships for women from local community colleges. The foundation plans to continue contributing to humanities and feminist studies. "By supporting access to STEM (science, technology, engineering, and math) as well as feminist studies programs, we are highlighting the intersection between these fields and the need for a comprehensive approach to creating a foundation of human equality," said Nicole Baran, executive director of the Peggy and Jack Baskin Foundation. 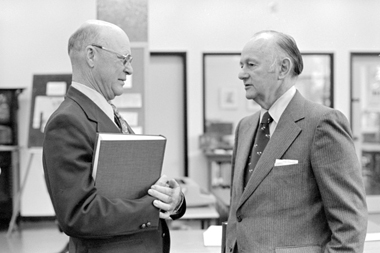 Joseph Long, an entrepreneur and founder of Longs Drugs, had a strong friendship with UC Santa Cruz's founding chancellor Dean McHenry. Out of loyalty and friendship, the highly successful East Bay–based businessman contributed $1.9 million to the university's fledgling marine sciences program. His most significant gifts were a discretionary fund for the chancellor and a capital gift to build a marine mammal research center at Long Marine Lab. Each of these contributions was more than $650,000. 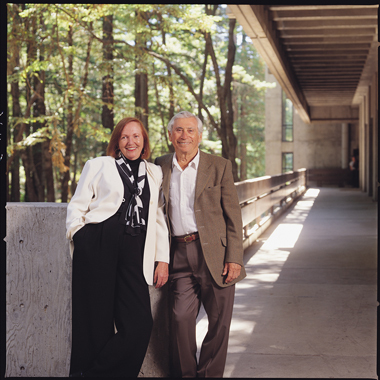 Created in 1966, the Joseph & Vera Long Foundation continues to support the university. "We've had a good relationship with UC Santa Cruz," said Milton Long, grandson of Joseph and executive director of the Joseph & Vera Long Foundation. "We've wanted to continue to support the marine lab. It fits in with the foundation's mission of conservation and education in Northern California." The foundation has continued to invest in the development and growth of the Long Marine Lab. It helped fund the building of the Seymour Marine Discovery Center with a $250,000 capstone gift to the capital campaign, and gave $250,000 toward the Center for Ocean Health and $1 million to renovate the marine mammal research center. Joseph's son, Bob Long, continued to give personal gifts for decades to assist the Friends of Long Marine Lab/Seymour Center. Joe and Bob, through the Joseph & Vera Long Foundation, also supported South and Southeast Asian studies, UC Santa Cruz's libraries, endowments for Pacific Rim studies and marine sciences, the Seymour Center's education programs, and the apprentice program at the Center for Agroecology & Sustainable Food Systems. One of the first names any incoming student at UC Santa Cruz ever hears is that of Alfred E. Hahn, whose name graces the student services center. Hahn worked as a sales manager for a number of toy companies and was known for having a humble and reclusive nature. A native of New York, Hahn and his wife, Margaret, retired to Santa Cruz in 1955. Hahn’s interest in helping UC Santa Cruz students began in 1965, when he read an article by the founding chancellor, Dean McHenry, which described the financial need of UC Santa Cruz students. The student services center building's original name—Central Services—was rather boring and prosaic, especially considering it was the very first building completed on the campus. The structure now known as the Alfred Hahn Student Services Building was completed in 1965. Unfortunately, the original building was doomed. In April 1971, a frayed extension cord sparked the most devastating fire in UC Santa Cruz history, and Hahn Student Services suffered serious and extensive fire damage. But the administration wasted no time in repairing the building. Hahn Student Services now houses student services offices including general administration, registrar, financial aid, student housing, and disability resources. Hahn bequeathed a $1 million trust fund to UC Santa Cruz in 1984, and the first Hahn Scholarships were awarded that year. Hahn committed his life’s estate of $1 million as an endowment to provide undergraduate scholarships to students at UC Santa Cruz who have financial need. "Santa Cruz is a new university without a lot of established alumni, so I felt that anyone who could help should step forward…," the late Hahn explained. "I didn't do any of this for the publicity. If I can just help one student, that's what I want to do." What's in a (college) name? A quick rundown of how UC Santa Cruz's colleges got their names. Cowell College is named for Henry Cowell and the Cowell family, former owners of the Cowell Ranch property that is now the site of UC Santa Cruz. Stevenson College honors Adlai E. Stevenson, former governor of Illinois, Democratic presidential candidate, and ambassador to the United Nations. He was selected because of his life of public service and his dedication to the principles of democracy. Crown College is named after the Crown Zellerbach Paper Company, which gave the initial donation to fund the college. Merrill College is named after Charles E. Merrill Jr., whose father, Charles E. Merrill Sr., was the founder of wealth management firm Merrill Lynch. In 1968, the Charles E. Merrill Trust donated funds for the construction of the college. Porter College is named for Benjamin Porter, grandfather of three University of California benefactors: Porter Sesnon, Barbara Sesnon Cartan, and William T. Sesnon. Kresge College was originally endowed by the Kresge Foundation. The Kresge family fortune was derived from the Kmart chain of discount department stores. Oakes College was named after philanthropists Roscoe and Margaret Oakes. Colleges Eight, Nine, and Ten are as yet unnamed and still seeking eponymous philanthropists. For information about naming a college, please contact Jeff Shilling at shilling@ucsc.edu.